Well, it's the 2012 BMW M5 concept anyway (of a car we already drove!). BMW held a private unveil of the BMW M5 concept to a select few journalists in Munich, Germany this week and somehow these shots leaked out. The event featured a tour of the hidden garage at the BMW M facility in Garching along with an unveiling of other concept cars. But the main event? 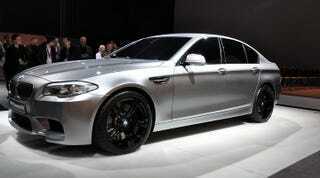 The F10 M5. And here it is. These journalists were all under an embargo of April 7th, but thankfully, we're not under any embargo for this or any other photos of the new concept BMW M5. Look at all of those embargoed be-jacketed journalists back there. And none of them can run these shots you see here today. So — have at ye!